Are you insured for a hurricane? Bicyclists from the across the United States will join together to celebrate National Bike to School Day. Bike to School events work to create safer routes for bicycling and walking, and emphasize the importance of a range of issues such as increasing physical activity among children, cyclist and pedestrian safety, traffic congestion, concern for the environment and building connections between families, schools and the broader community. If a hurricane strikes, you’re going to need supplies not just to get through the storm but for the potentially lengthy recovery period that could follow. Have enough non-perishable food, water and medicine to last each person in your family a minimum of one week. Electricity and water could be out for at least that long. You’ll need extra cash, a battery-powered radio and flashlights. You’ll also need a portable crank or solar powered USB charger to charge your cell phone. 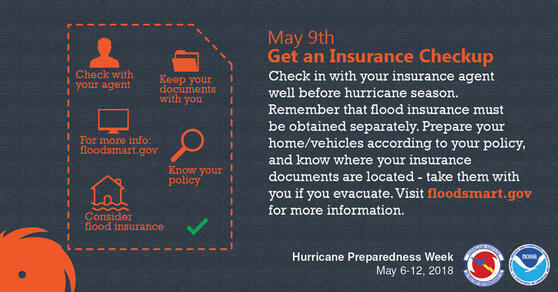 During Hurricane Preparedness Week, make sure you have a hurricane evacuation plan. The first thing you need to do is find out if you live in a storm surge hurricane evacuation zone or if you’re in a home that would be unsafe during a hurricane. If you are, figure out where you’d go and how you’d get there if told to evacuate. You do not need to travel hundreds of miles. Identify someone, perhaps a friend or relative who doesn’t live in an evacuation zone or unsafe home, and coordinate with them to use their home as your evacuation destination. Be sure to account for your pets, as most local shelters do not permit them. Put the plan in writing for you and those you care about. Miami Shores Farmers Market extended through summer! Tonight's #VillageCouncil Meeting has been canceled. Plaza 98 project entered in the People's Choice Safe Streets Award! Vote today!